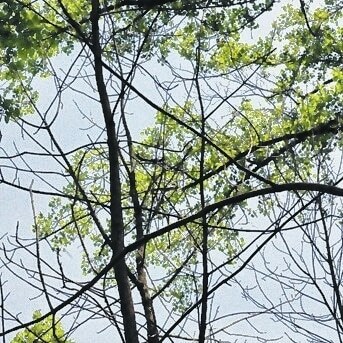 Ash trees at Cedar Bog have been hard hit by the emerald ash borer parasite. Bog officials are discontinuing a program that released wasps to eat the beetles, saying it did not seem to work. A wasp-release program to save ash trees in Cedar Bog Nature Preserve has been discontinued, officials say. Cedar Bog Site Manager Tracy Bleim said the program, which released batches of wasps to counter the emerald ash borer pest that is killing ash trees, will not be continued this year. “Most of the (ash) trees are dead or too small,” she said. “We released over 35,000 of the parasite wasps.” The wasps eat the ash borer beetles (among other bugs). There are three different species. Cedar Bog took part in the wasp-release program for three years, beginning in 2012. The program was paid for by the U.S. Department of Agriculture, Bleim said. Bleim said she was uncertain why the program did not work. The wasps were released, but they may not have taken hold in the bog. Bleim said they were monitoring a number of trees last year and 10 of the 12 were dead at the start of last year. The emerald ash borer is an exotic beetle discovered in southeastern Michigan in 2002, according to the Emerald Ash Borer information page (www.emeraldashboerer.info). The adult beetles feed on foliage, but the larvae feed on tree bark, disrupting a tree’s ability to transport water and nutrients. The beetle began being seen in Ohio in 2003. In 2013, Cedar Bog officials took out 42 ash trees along the boardwalk. Last year, they took out 20 more trees, and this year there are 40 trees marked for removal, Bleim said. There are a mix of black ash, pumpkin ash and green ash trees in the bog. Bleim said staff are not allowed to plant in the preserve, that it needs to recover on its own. Bleim said she hopes other species will fill in for the lost ash trees, such as tulip trees or cedars. The cedar trees are also facing their own water fungus problem. Bleim said bog staff will bring in an expert to look at those trees to determine if it is something that is limited to older cedar trees or if it will impact all of them. The ash tree loss has not led to a decline in visitors, she said. For more information about Cedar Bog, visit www.cedarbognp.org.